SACRAMENTO— The Center for Biological Diversity today formally petitioned the California Fish and Game Commission to list the foothill yellow-legged frog (Rana boylii) as a threatened species under the California Endangered Species Act. This stream-dwelling frog has disappeared from more than half its former locations in California. It faces a host of threats including dams, water diversions, logging, mining, marijuana cultivation, off-road vehicles, pesticides, climate change, invasive species and disease. Foothill yellow-legged frogs were once found in many of California’s streams and rivers at low to moderate elevations in Pacific Coast drainages, as well as the lower western slopes of the Sierra Nevada mountains, from the Oregon border to at least as far south as Los Angeles County, and possibly to San Diego County. The species is now extirpated from all coastal streams south of San Luis Obispo County and is nearing extinction in the southern Sierra, south coast, central coast and San Francisco Bay Area regions. In most areas of the state there are very few large foothill yellow-legged frog populations remaining; as of 2005 only 30 California sites had populations of 20 or more adult frogs. 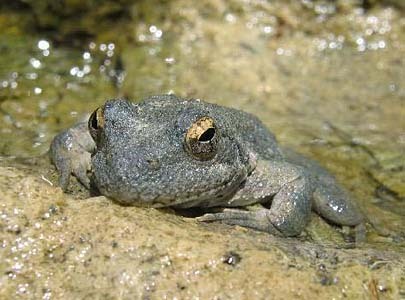 The Center also petitioned in 2012 to protect the foothill yellow-legged frog under the federal Endangered Species Act. The U.S. Fish and Wildlife Service will make a decision by 2020 on whether the species warrants federal protection. Two related species of native frogs that inhabit high Sierra lakes and streams, the Sierra Nevada yellow-legged frog (Rana sierrae) and the mountain yellow-legged frog (Rana muscosa), are already federally and state listed as endangered or threatened. Adult foothill yellow-legged frogs are moderately sized (1.5 to 3 inches), with a distinctive lemon-yellow color under their legs. They inhabit partially shaded, rocky perennial streams and their life cycle is synchronized with the seasonal timing of streamflow conditions. Adult frogs move throughout stream networks from winter refugia to mating habitat where eggs are laid in spring and tadpoles rear in summer. They breed in streams with riffles containing cobble-sized or larger rocks as substrate. These frogs need perennial water where they can forage through the summer and fall months. The largest foothill yellow-legged frog populations in California are in the north coast range, particularly in the Smith River, tributaries of the Klamath River, South Fork Trinity River, South Fork Eel River, Redwood Creek, coastal tributaries in Mendocino County and Russian River tributaries. But only six sites in Northern California have large frog populations exceeding 100 breeding females per kilometer of river, with an additional nine sites having more than 50 breeding females per kilometer. Even in the north coast, considered stronghold for the species, frogs have been lost from one-quarter of historical sites where they formerly occurred. Significant foothill yellow-legged frog populations also remain in the Diablo Range, throughout Sonoma County, and in the upper Sacramento River basin. Healthy frog populations persist in many river basins in the northern and central Sierras, including the American, Clavey, Cosumnes, Feather, Merced, Mokelumne, Stanislaus, Tuolumne and Yuba rivers. But many former Sierra populations have been lost and the majority of recent observations in Sierran national forests are of small and scattered populations with limited evidence of successful reproduction. At least half of the known historical locations have been lost in every northern and central Sierra county except Plumas County. Photo by James Bettaso, USFWS. This image is available for media use.